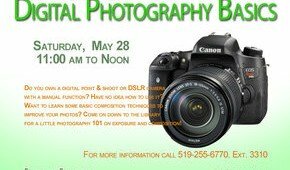 Do you own a digital camera and want to learn how to take your photography skills to the next level? You’re invited to join us for the 2nd installment of our “How-To” Workshop Series! The workshop will be taught by local photographer, Liana LoDuca, whose work was recently on display at Central Library’s Community Art Wall. Liana will share helpful tips for composing the perfect photograph, using examples of her work. She’ll also give you insight into choosing the best exposure for your subject and setting. You’ll also have the chance to ask Liana about any other digital photography queries you may have. Don’t forget to click on Liana’s name above to view and learn more about her work! This workshop will take place on Saturday, May 28 from 11:00am-12:00pm at Budimir Library. You’ll definitely want to bring your camera to get the most out of the workshop and we do ask that you pre-register as space is limited. You can do so by calling Leisa at 519-255-6770, ext. 3310. Keep your eyes peeled for more our “How-To” Workshop Series. Next on our roster – Bookbinding Basics! 2 Responses to "Calling All Photography Buffs"
Hi … I see the last “digital photography” workshop was May 28. Are there any others coming up? Thank you for your question, Sean. We don’t currently have another digital photography scheduled but would love to offer another in future, if possible. Rest assured that any future workshops will be advertised well in advance and you’ll have plenty of time to register.